What a lovely evening in the Braid Arts Centre in Ballymena, and to complete the evening I am so honoured to say that I have won 'Northern Ireland Young Artist of the Year 2015'. ‘’A 22- year- old Glenarm woman has been named as Northern Ireland Young Artist of the year 2015 as a glittering awards ceremony at the Braid Museum and Arts Centre. Using both porcelain and black clay Sasha has created exclusive sculptural forms, influenced by the sea, forest, coast and glens using various skills and techniques to enhance the clays natural qualities. 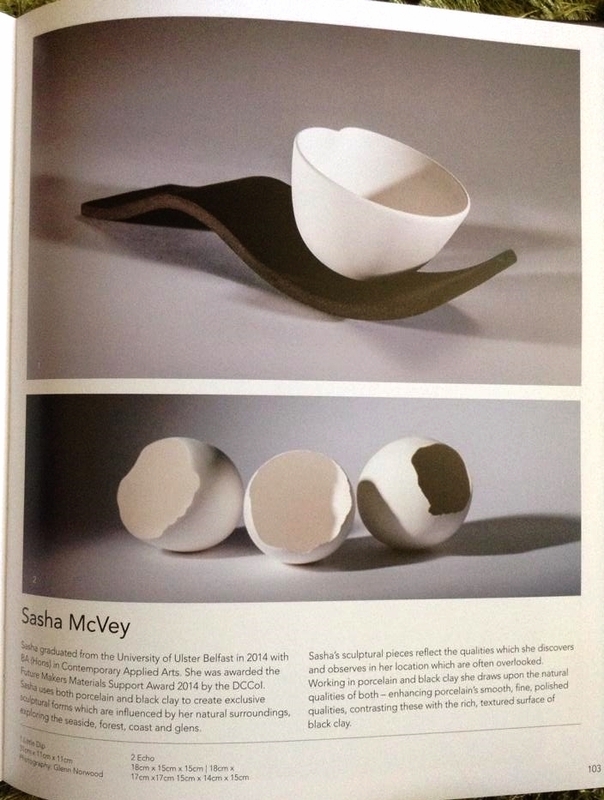 Sasha graduated from the University of Ulster with B.A Honours Contemporary Applied Arts degree. Vison Express was principal sponsor of the competition, organised by the Rotary Club of Ballymena, together with the Braid Museum and Arts Centre in Ballymena. The competition was supported by Artsworks NI and Raceview Mill. The works of all award winners are on display in the Braid Arts Centre until 23rd April. 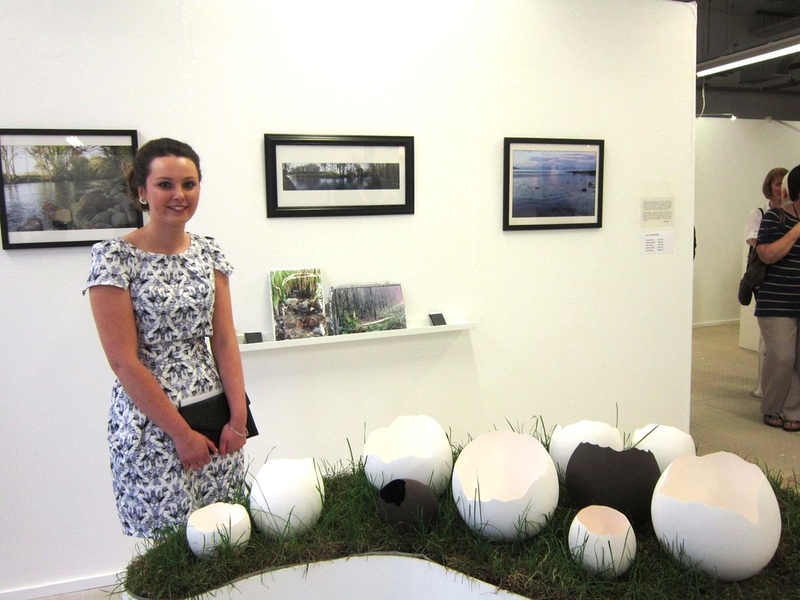 Afterwards examples of the winner’s works will be on exhibition in Raceview Mill Broughshane. In second place was Niamh McConaghy, third went to Jessica McAfee and fourth was Andrew Haire. Artists receiving highly commended awards were Timothy Adams, Sarah McClure, James Dalton, Matthew Allen, Brian Kielt, Gary Dougan, Jennifer McNeill and Alice Blackstock. Artists from all over the province entered the competition. The panel of judges included Guardian editor Jim Flanagan, Mid and East Antrim Arts Development Officer Rosalind Lowery, Rotary Club president Lesley Crawford, local SDLP councillor Declan O’Loan and renowned Irish artist Paul Bell. You can check out my interview with Aislinn Hagan on IrishTV, along with a few fellow makers from the church street craft market. Back in 2014 I had been nominated for the International Arts and Crafts Design Awards and I am so thrilled to say that I have been awarded the International Arts and Crafts Design Award Certificate of Excellence 2014. Thank You to all who came to the Contemporary Applied Arts Collective exhibition at the Ards Arts Centre, Newtownards. An exciting collaboration with fellow makers from the Belfast School of Art. 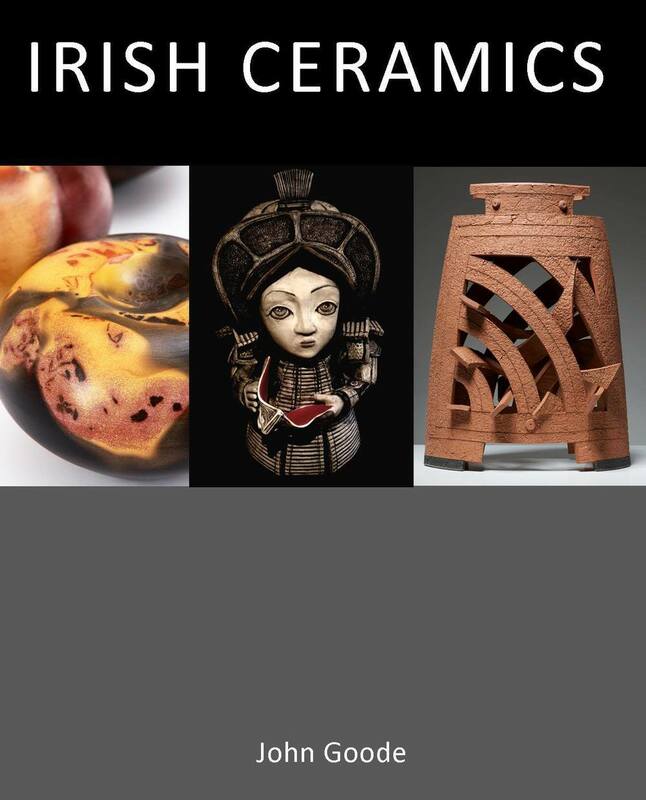 I am delighted to be one of the many artists, designer, makers documented in this exciting new book Irish Ceramics by John Goode, capturing the most important contemporary ceramic artists in Ireland. My products will be showcased and available to purchase on the 11th & 12th October at Kings Hall Belfast as part of the Improve Your Home Show. I will be located within Design and Craft Village, where you can find me at stand B59. I am so exciting to tell you that I have been selected to take part in Create 100, a new creative enterprise which is organised by the Royal Bank of Scotland and The Ballymena Business Centre. The doors are now official opened since October to 51-55 Church Street Ballymena. 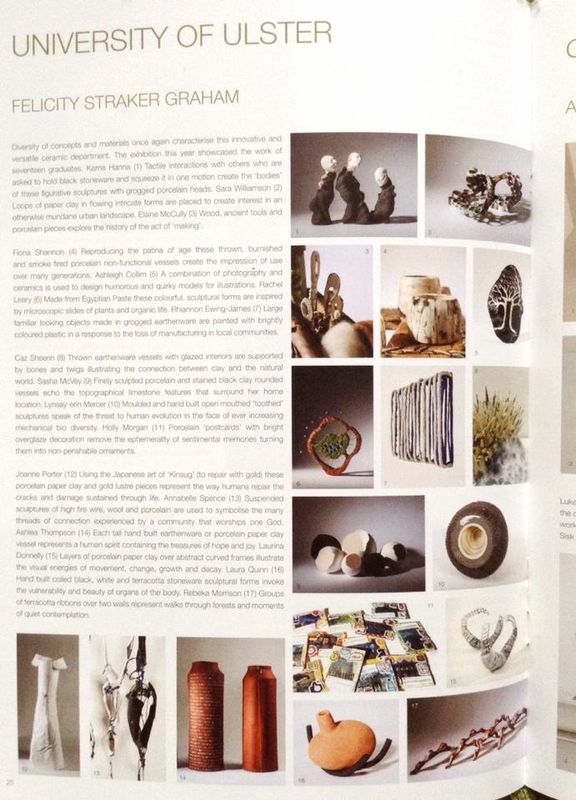 My work is on display and for sale along with a collaboration of 30 fellow artists, designers, makers and more. So if you are in the area please do pop in. Future Makers Awards and Supports Evening in Dublin with Sasha McVey (Right) Rhiannon Ewing (Left) Materials Support Winners. What a beautiful day it has been in Dublin, and to finish the day off I am pleased to say that I have been awarded the Future Makers Material Support Award 2014 organised by the Design and Crafts Council of Ireland. Congratulations to all support and award winners, along with my friend Rhiannon. What a wonderful evening with many talented people, having seen some amazing innovative arts, crafts and designs from around Ireland. Thank You to all who came to the opening of the degree show exhibition at the University of Ulster last night the 6th June. If you didn’t get the chance to come last night it is open until Friday 13th June. Keep up dated with my progress and work @Sasha McVey Ceramics on Facebook, Twitter and more on my website.